Features a Black Extended Bolt Release and Black Trigger. Complete drop-in kit for the Ruger MKII and MKII 22/45 to provide a crisp, clean 2.25lb trigger pull (pull may vary slightly due to factory frame variances). The kit includes an extended bolt release (extended bolt release is not used when installing in a 22/45), target hammer w/bushing, target sear, target trigger w/over travel screw, return trigger plunger spring and polished plunger. No stoning required. Final trigger pull may vary slightly due to factory frame variances. Please Note: The MKII Kits include a Volquartsen MKII Hammer Bushing and Target Hammer. Do not attempt to use any other after market hammer bushing with these kits. 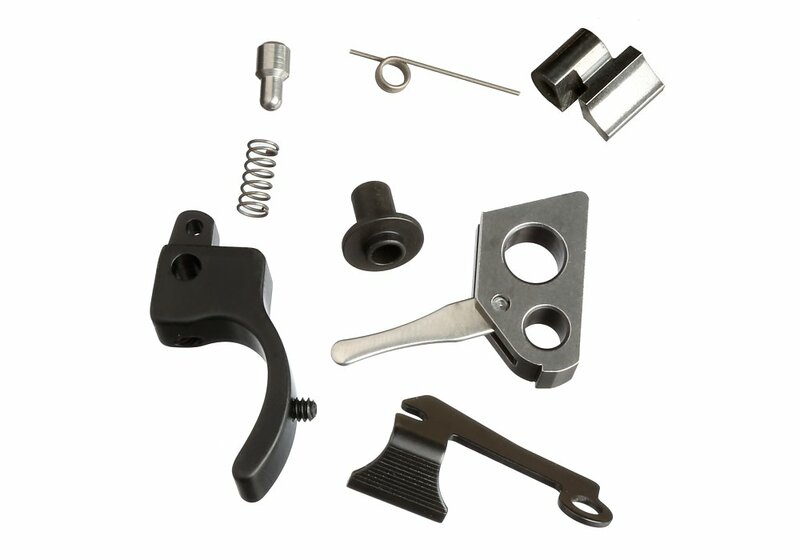 Ruger Mk III Owners: If you want to eliminate the Mk III magazine disconnect, the Mk II bushing and target hammer in this kit will allow you to remove your Mk III magazine disconnect lever and spring. Order this kit to convert the Mk III. I installed the trigger kit about a week ago. There was a small issue with the trigger itself & Volquartsen rendered super service & sent me a replacement quickly. The results are good.......all the difference in the world. Great Product!! Very well engineered. Very nice trigger pull after install. The installation is fairly simple. Just takes your time to understand the parts and it all goes back together with some patience. Well worth the money. The Volquartsen Accurizing kit and parts I put in my Ruger 22/45 lite has made it the fastes gun I have ever owned. What a great change. Wow was my first impression. Read right at 2.25 on my trigger gauge. I installed this on my Ruger MK1 in less than 30 minutes. Will take longer on MKII and MKIII due to more springs and mechanisms. All of the parts are very high quality. Volquartsen threw this out of the park. Another shout out for Eabco and really fast shipping, came in so fast I forgot to duck! I am very pleased with my purchases and the purchase process. The slingshot bolt release is a bit tricky because of the way the spring detent works and I have had to do some adjusting to keep it from working out while the gun cycles. Otherwise delivery was very fast and the products perform as described. The accurizing kit is actually pretty amazing. I was not pleased with the stock trigger/trigger action. This kit cures the pain of the magazine safety and the new action is fantastic. I would recommend both. Got the trigger on a week before a major match. Installed the MK II kit in my MK III to defeat the mag safety. Works great. About 2.5 lbs. Great upgrade for the Rugers. This Volquartsen kit turned my Ruger MKIII Hunter into a new pistol. Installed in 22/45 Lit. Install was straight forward and with a little bit of fiddling, got it in. Sweet trigger pull, I like it. Truly a drop in part. I didn't need to do any fitting. The trigger pull on the stock gun was terrible ! The kit has no creep at all and breaks like glass. Highly recommend. Installed this kit in a Mark III. Very easy install, quality components, excellent results. Because of price and shipping options, E.Arthur Brown made this a value purchase. Couldn't be happier. I'm mechanically inclined so install was pretty easy, but if you follow directions and watch videos online, most folks should get it. Trigger feel is amazing now my Roger mark III 22/45 is my favorite firearm! I had my stock trigger worked over but that is nothing like the smoothness enabled with the Volquartsen. It is definitely worth the money to make this upgrade. great product- best prices on the net- highly recomended. Came on time as adverrtised. Would not have been able to install without youtube videos. Would appreciate a link with the package to a Volquartsen video that showed installation procedures. Install was very easy! Lot's of good reference and videos on Internet to help you with this. Trigger is soso much better than factory. Fast shipping! Best investment made for the mark 3! Highest quality, easly to install and great trigger pull. Great value for your dollar. I would buy this again. Very easy to install resulting in a nice crisp 2-2.25 lb break. I recently ordered one of the MkII kits for a friend's daughter who is training with a shooting team. He has installed the kit and has had excellent results on a MkIII 22/45 Lite. I just ordered one for myself, along with two spare mags. Purchased two Volquartsen accurizing kits from EABCO and thought I could install them myself- decided to send them directly to Scott at Volquartsen to have installed. This was the best purchase and best decision I have made concerning my Mark III's. They have a very light trigger pull, which has enhanced their accuracy. I could not be more pleased. I highly recommend the Volquartsen accurizing kits for the Mark III. I have one more pistol and will be adding one to it also. Thank you EABCO for a great price and thank you Volquartsen for a great product and a great install. This trigger is a great improvement and went in with little trouble. Big old fingers and old eyes didn't help but we're rocking and rolling now just fine. As an old competition shooter I demand a good trigger and this one works well. You will realize a huge difference in trigger pull and reset--much better! Everything is smoother. Please view the installation videos @ fourguysguns.com. Well worth the investment for any type of shooting, plinking, or bullseye. If looking for the one thing that makes your Ruger a better shooter, this is it. Put this in my first MrkIII 22/45 and the next day won my first shooting competition. Now I have built 4 more shooters for friends and it all starts with this trigger kit. Great item.Reduced trigger pull from 5.5 pounds to 2.4 pounds on my ruger 22/45 pac-lite.Easy install with great results. This kit is great! Trigger breaks like glass. Not hard to install, just watch some videos on youtube on how to install and you're all set!